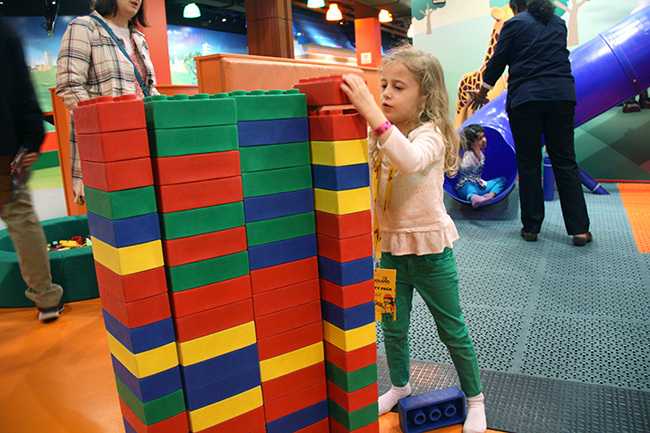 On our second day at The Great Wolf Lodge, I wanted to escape for a bit to take the kids to Legoland Discovery Center in Kansas City. I have been wanting to take them there for a really long time and this was our chance! We woke up and had a delicious breakfast at the hotel and then headed down to the Crown Plaza to arrive at Legoland at 10:00 a.m. (opening time!). 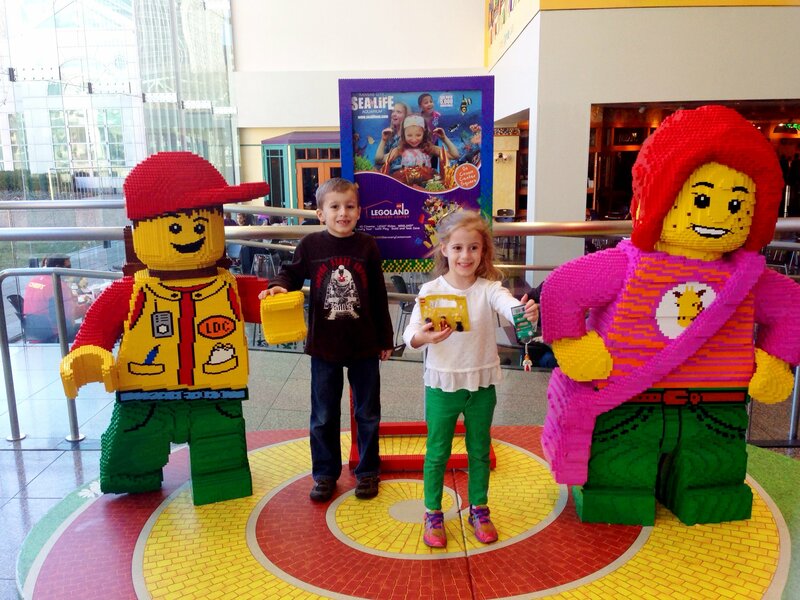 This photo was actually taken inside the Crown Plaza mall, across from Legoland. Legoland is ALL indoors and they even have another area called Sea Life that costs an additional fee to go in to see. If when we come back to Great Wolf Lodge, we’ll probably tour the Sea Life section, since it costs just as much as the Legoland area. Since both areas take several hours to explore, I was glad we didn’t buy tickets for both Legoland and Sea Life. Legoland included TWO rides, which was terrific since it was all inside! 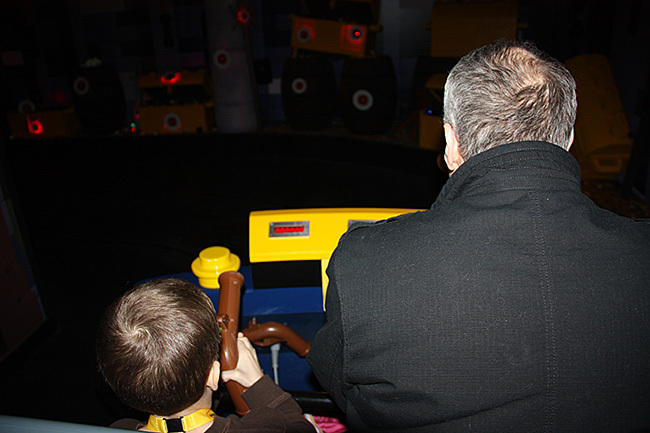 The first ride was on a ‘lego’ chariot and we were given guns to shot lasers at the ‘bad guys’. 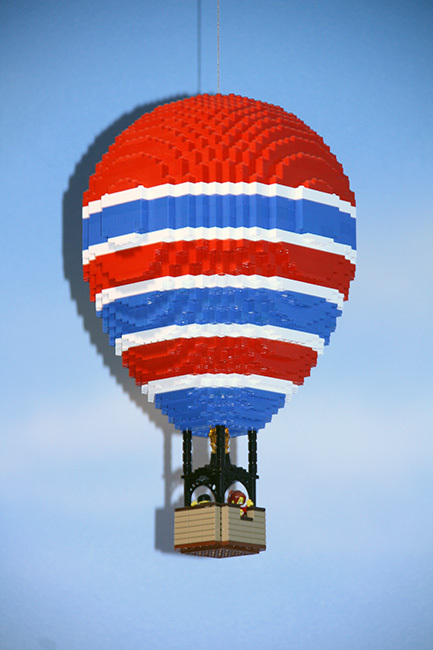 This would be the coolest job ever, Master Lego Builder. You can’t see his name tag, but his name was Jeremiah Boehr and he even has a Facebook page HERE. 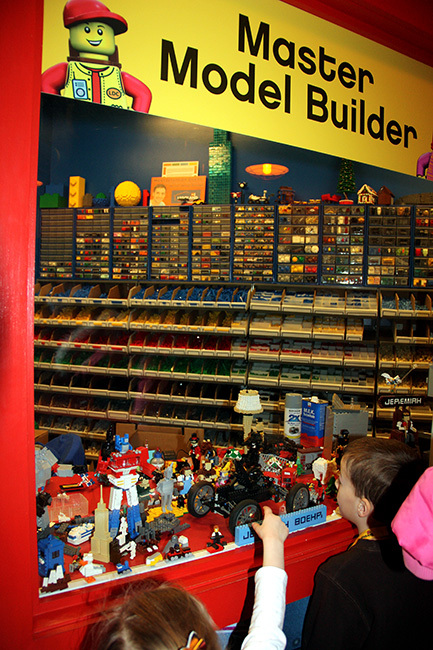 Now, don’t ask me WHY I am so interested in looking up this info… but, a Master Lego Builder starts out with a salary of $37,500 per year and if you are wondering how to become a Master Lego Builder, click HERE for details. Can you imagine having that job experience on your resume? 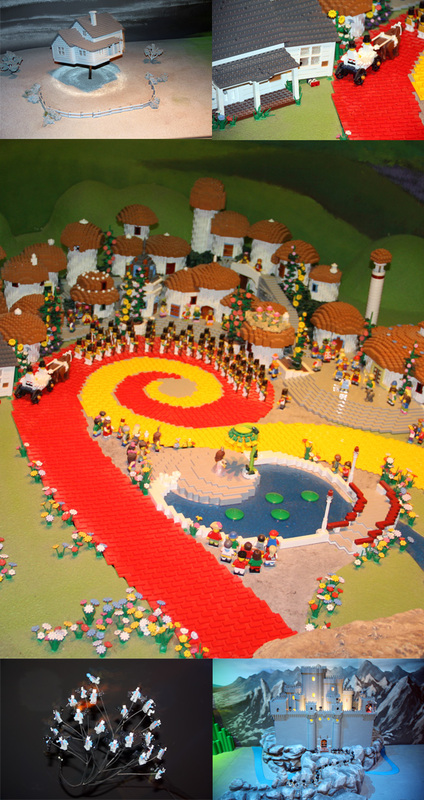 Next we visited Miniland, which was my favorite experience at Legoland. 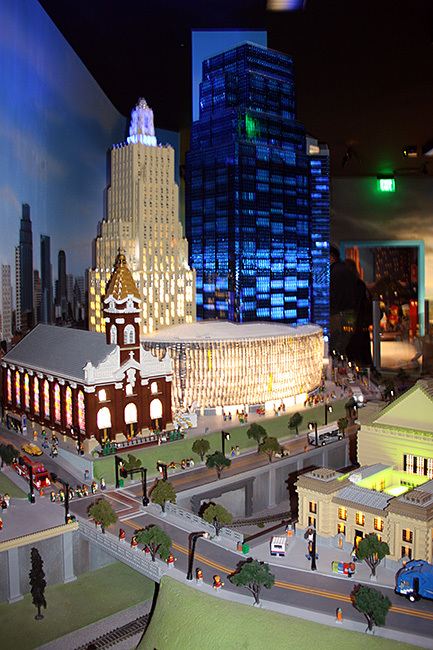 I would love to see the Miniland in California, but the one in Kansas City will do for now. 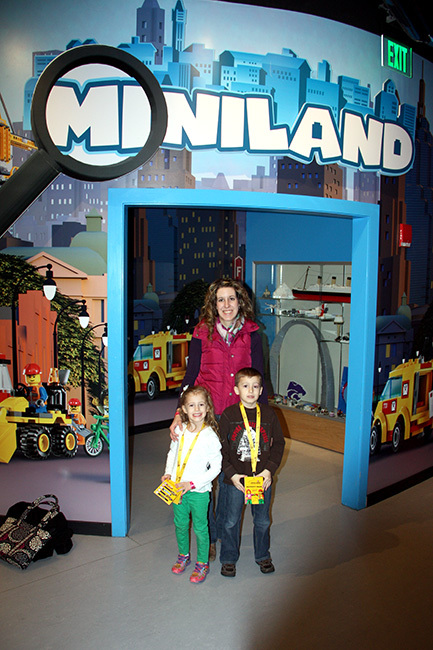 Here is a photo of me and the kids before we stepped inside Miniland. While in miniland, the lights would go from ‘sunny’ to ‘dark’. I loved how they incorporated night life with lights on the buildings, etc. and cars! So imaginative! 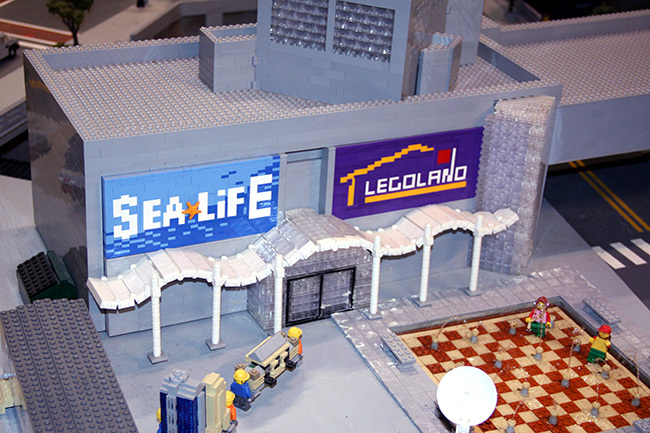 Here is a mini replica of the Legoland and Sea Life building. 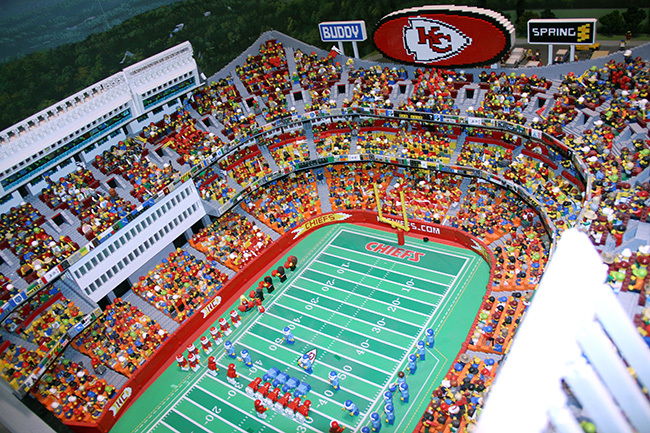 Arrowhead Stadium, where the Chiefs play. I love how each of the little lego people in the stands is doing something or looks different. SO creative, a mighty lot of time was spent on creating this! 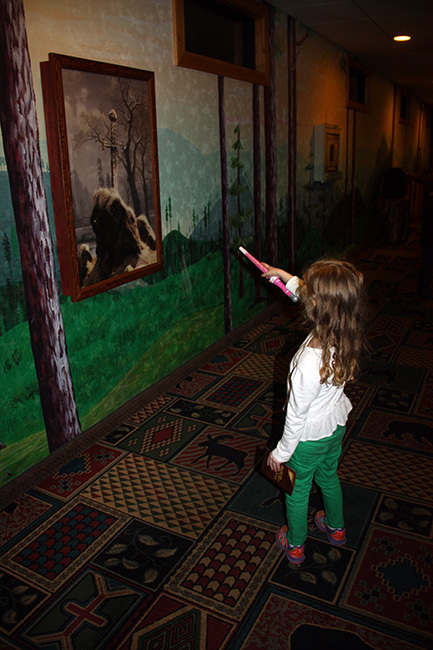 AND, they had a whole area devoted to The Wizard of Oz! Because… “Toto, I’ve a feeling we’re not in Kansas anymore.” It was SO cool! Below you will see a collage of photos I took, I took WAY too many. Which, I might add. My kids have NEVER seen The Wizard of Oz. I need to hang my head in shame… SO, this weekend we are going to have a movie night and watch it. I am sure some parts will scare Autumn, but I know Nathan will LOVE it! 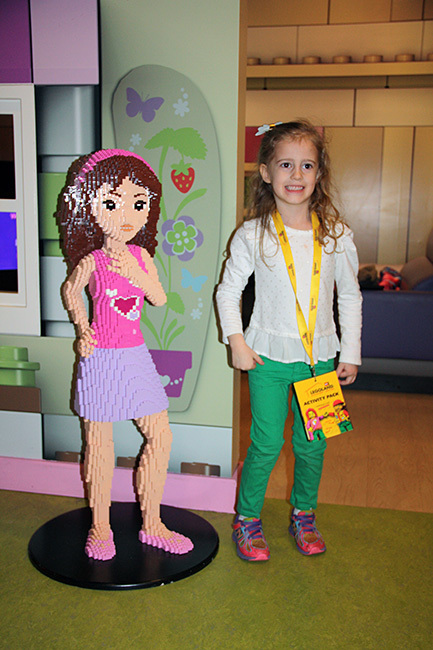 After Miniland we split up… Autumn and I checked out the girly legos. Autumn also spent an hour (or more!) playing with these soft jumbo sized legos. She built a massive house! She was SO proud of it. I was about to take a photo of it when she was done, but a little boy accidentally bumped into it and knocked it down! aww! While Autumn and I played, Nathan and Brian were making race cars and racing them! 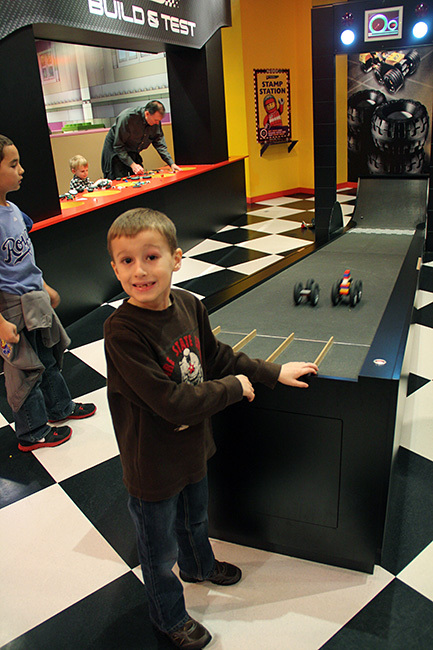 They have something similar to this at the Magic House in St. Louis, but not nearly as massive or cool. If Nathan’s one eye looks a little red, it is because he got something in it and got a little scratch. We took him to the eye doctor and they suggested regular eye drops, but I am sure the chlorine did not help it. Thankfully it is all better! 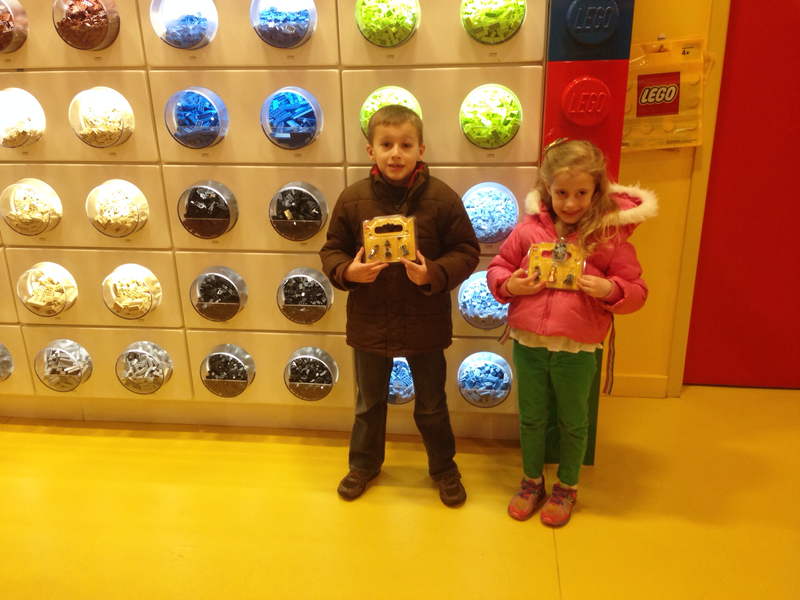 Of course, no lego trip is complete without a trip to the store! Nathan and Autumn both made packages of 3 characters. They got to select the face, body and legs… oh, and hair! 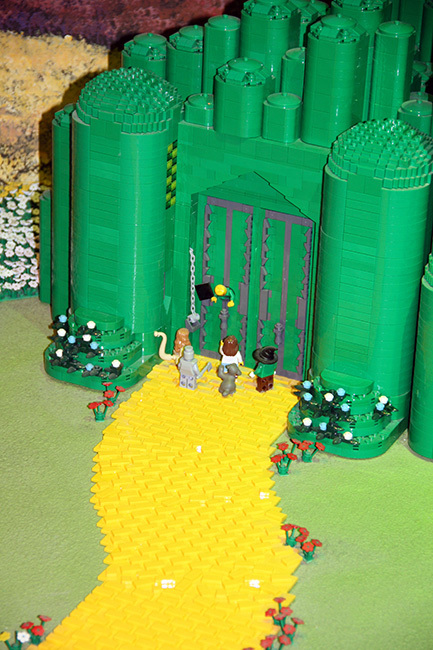 If you would like your kids to enjoy more of these legos visit this post by My Kid Needs That. After Legoland, we were starving so we walked over to a restaurant called Fritz’s that one of my coworkers had told me about. 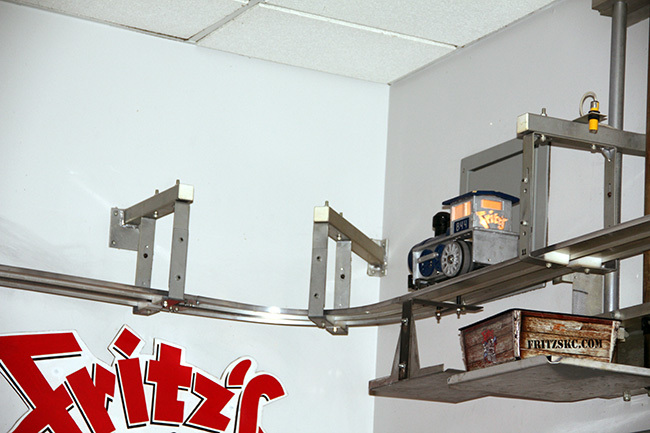 This restaurant has several trains that run on tracks above the tables and they deliver your food on a lever that drops down. 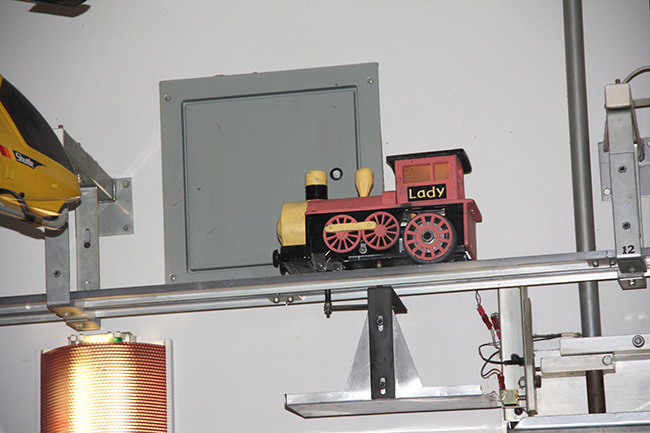 Here is a train dropping off someones order. Nathan was THRILLED! 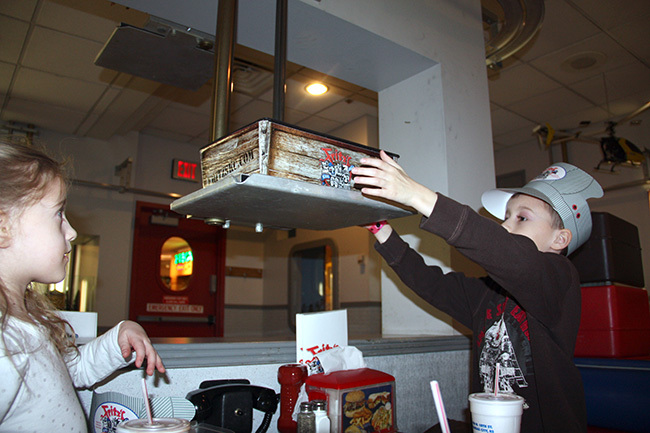 The boy does love his trains… and, the food was really good! I got a hamburger with hashbrowns on top! It was weird, but delicious! You even got to place your order by phone! 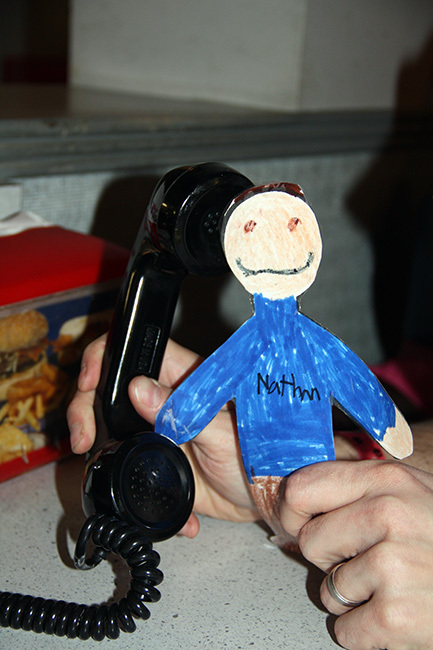 That Flat Stanley Nathan next to the phone is a book that Nathan read in school and we need to take photos of his Flat Self wherever we go. Then, when our train arrived… we were all excited! 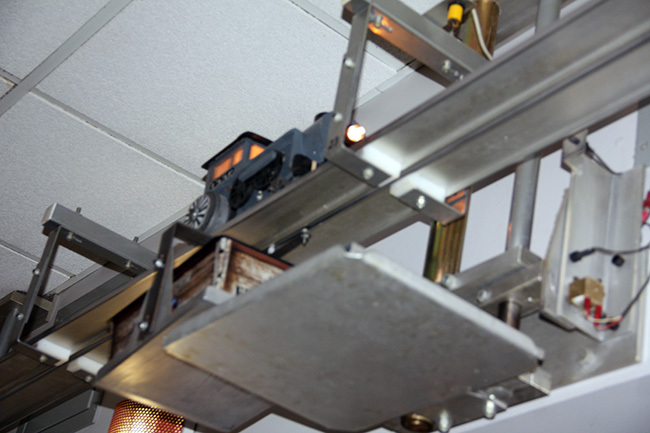 I had the camera ready, so I took some quick photos as it dropped our food onto the little lever. Nathan pulling the food off the lever. 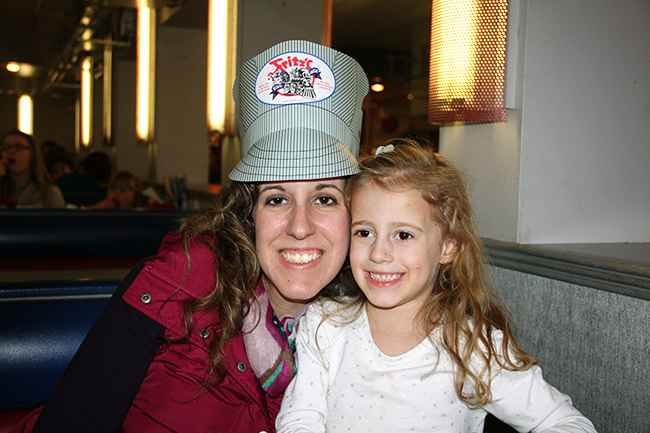 Autumn was excited to see a pink train! 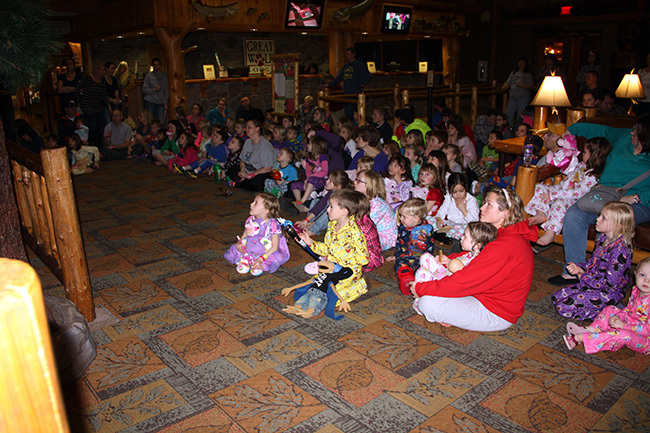 After eating at Fritz’s, we headed back to the Great Wolf Lodge and relaxed for quite some time. Then, we headed back down to swim for several hours! Sorry I don’t have any pictures of us swimming, but… it really took both of us to watch the kids in the water and I knew if I brought my camera down there it’d get wet! BUT, here is a photo of me and Autumn before heading to the water park. It was so nice, because our room was on the same floor as the entrance to the water park!! After swimming… we took ANOTHER break in the room. Which was nice. Especially since we had two TV’s in our room and they had all of the kids channels like Nickelodeon and Disney. Channels we don’t have at home, because Momma is cheap. 🙂 After resting, we decided to check out Magiquest. Which… we probably should have checked out the first night. Basically it is a scavenger hunt with 9 levels and you purchase a magic wand (and a magic wand topper, like Nathan did) and you get a booklet that tells you which items you need to find for each level. It was really addicting and they had several hallways in the hotel set up for it. 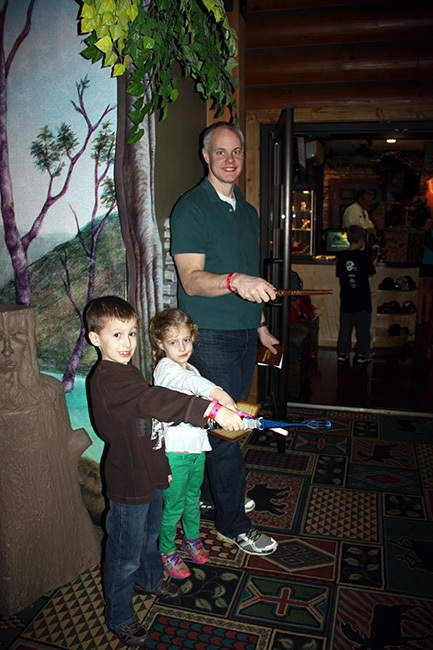 Here is Brian, Nathan and Autumn with their wands. I didn’t buy one, I sort of regretted that decision, too! Here is Nathan after completing the first level, there is a Gargoyle on the screen. We completed 3 levels out of the 9 in Magiquest before we left. Some kids took the game VERY seriously, we saw a couple of kids get upset, etc. when they couldn’t complete this or that. It looks like it gets a little more challenging near the end and you get to battle dragons, etc. Eek. At the end of the last night, we went downstairs for the clock tour story time. The kids were told to wear their PJ’s. 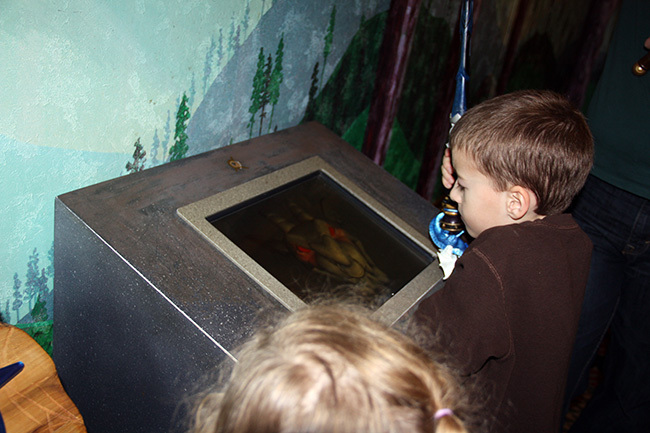 They watched the animated animals around the clock tower (think Chuckie Cheese). 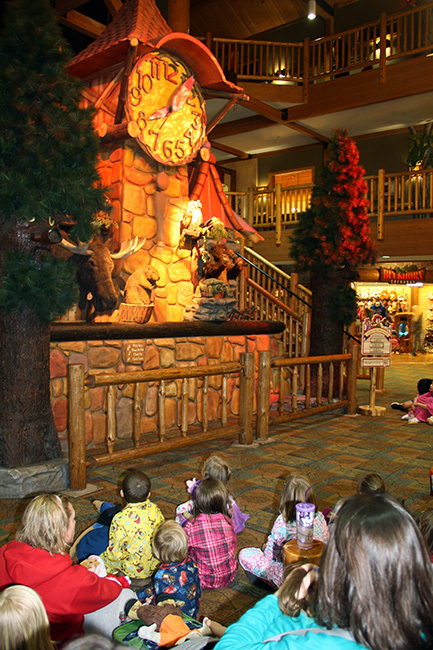 They had a few of the characters out and read a story about how the Great Wolf Lodge came into being. Then, they had the kids line up for a photo with the characters, but we skipped this… it was getting really late and we had ordered a pizza, soda and a bottle of wine up to our room! ha! 🙂 The kids said it was the BEST pizza EVER! They ate SO much! I think the swimming made them really hungry… and, we had ice cream before the story time (there is a HUGE coffee/ice cream/sweets shop at the lodge). 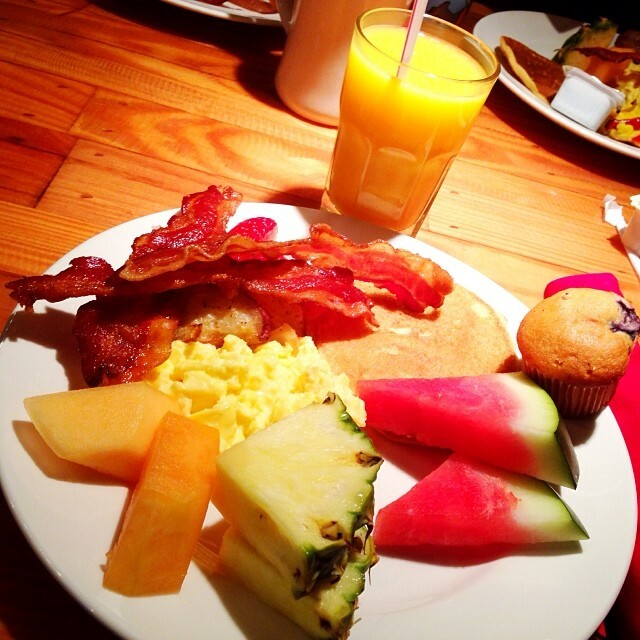 On our last day we enjoyed a breakfast at the lodge, it was a buffet with an omelet station. It was SO good… best eggs and bacon I’ve had in a long time! 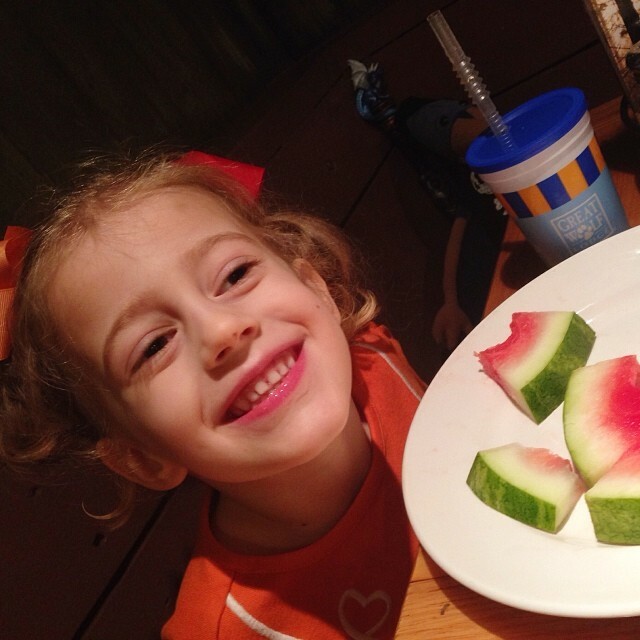 Autumn enjoyed a breakfast of watermelon! Silly girl! It was such an enjoyable trip! I think little get aways with the family is so important. It was nice to focus just on each other all weekend without any other distractions. And, it was nice to get in the pool… it has been such a snowy/cold and dreary winter! 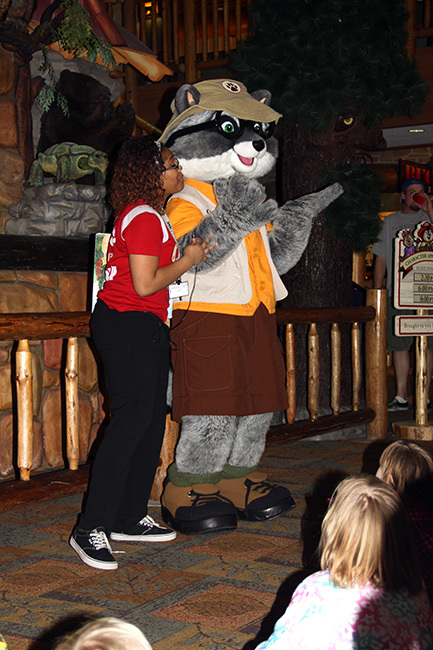 If you are planning on going to The Great Wolf Lodge anytime or if you have any questions, shoot away!